At least at the time of writing this. I’m sitting in gate G03 in Vienna’s airport waiting for my flight back to Larnaca. I have 4 hours until departure time so I do have some time on my hands. 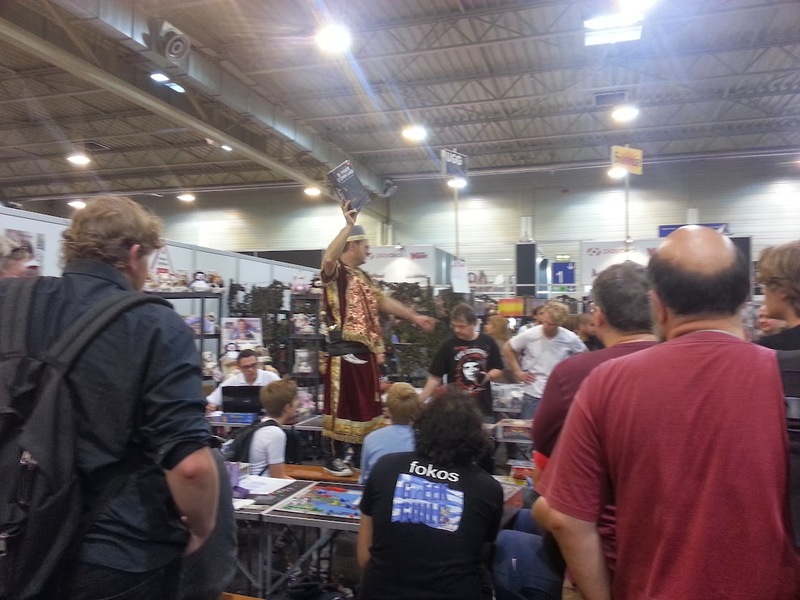 So, how was the trip to the greatest annual board games exhibition in the world? 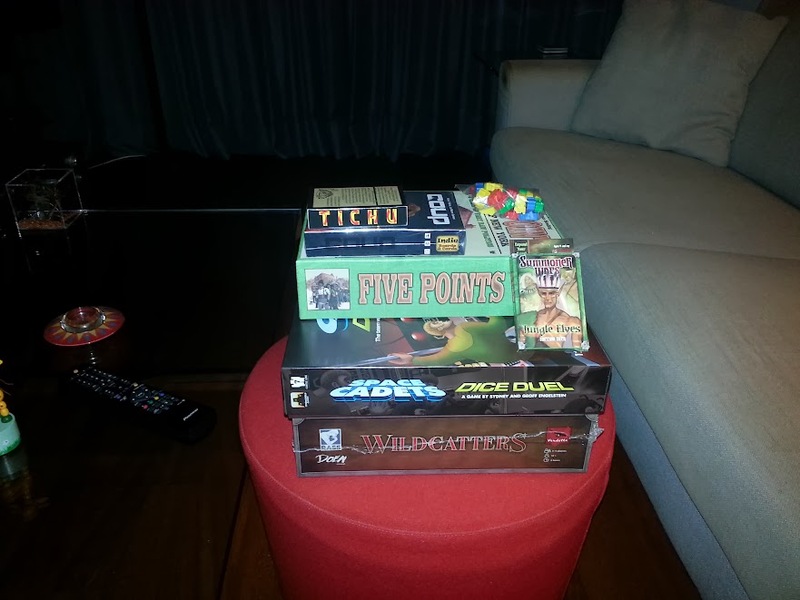 Well, I got an overload of new board games and the culture which exists in (and not only) Germany around this hobby. I think that’s what I’m taking back with me. This culture that I have seen here and which is missing in Cyprus. In Cyprus and many other parts of the world this is just another geek hobby. In Germany it’s also a family activity. I’ve seen families and friends sitting around a table (and even on the floor) playing board games together. Thinking, arguing, laughing together. Even crying! Kids’ games can be cruel sometimes. 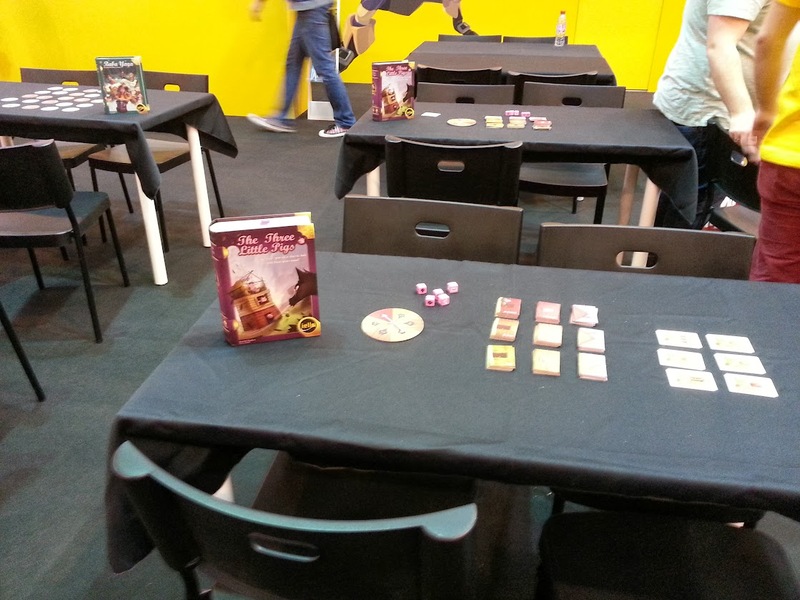 At the exhibition there were 3 big halls divided into booths with publishers and designers promoting their board games. From Hasbro promoting the next Monopoly variant to Andre (the Dutch) with his first board game design developed in collaboration with a friend. I actually ended up buying Andre’s game after his explanation of how it plays and reading the rulebook. The last time I made such a purchase, basically without reading or watching reviews, I ended up getting an awful game which I traded for another game. I’m not sure if it’s going to turn out any better this time but that’s not the point. The point is that you sit down with these designers and feel their passion while they are explaining their game. They are tired and anxious but the love for the hobby drives them. It’s definitely not about the money. There isn’t any. Nor fame. Apart from a couple of designers no one knows these people outside the hobby. It’s just love. Three Little Pigs – What a lovely game. This is going to be my god daughter’s Christmas present! Shhh! You could of course also buy games. Many people had trolleys and boxes filled with dozens of them. Yes I mean dozens and not small boxes either. This was especially evident on the first day. I bought some games for myself and I also broke the rule of not buying new releases. 3 out of the 5 games I bought are completely new. But games I could buy at anytime. I did not need to come here to do it. However, I did manage to get one signed by the designer whom I greatly respect and listen to his podcasts regularly. There is an intimacy here you don’t find in video games that often. Of course it wasn’t all perfect. I feel exhausted. For different reasons, some which can be explained and others which cannot, I barely got 4 hours of sleep every night. Combine that with the walking and standing from 10:00 to 19:00 in the first couple of days, and until around 14:00 the other two. The crowds (especially on Saturday) and the noise. You get the picture. If you remember from my first post I don’t expect to get sleep tomorrow either since I’m heading to the office first thing in the morning. It’s a bleak picture in physical terms. So,once again. Was it worth it? Just to see that this hobby is not marginal everywhere in the world. That there are countries where women and men of all ages play them. That families and friends still enjoy each other’s company and are willing to spend time together by playing these games. Without having a tablet or a smartphone next to them. I doubt it. I’ve seen what I came for although I did not realise what I was looking for when I left Cyprus. I came here looking for board games to play. Designers to see. To meet other board gamers from around the world. But I have seen something greater than that. I’m writing this on Wednesday, morning 23 October 2013. I’m sitting at my home desktop, drinking my coffee with a plan to visit M&S bakery later for breakfast. Mmmmmmmmm….. 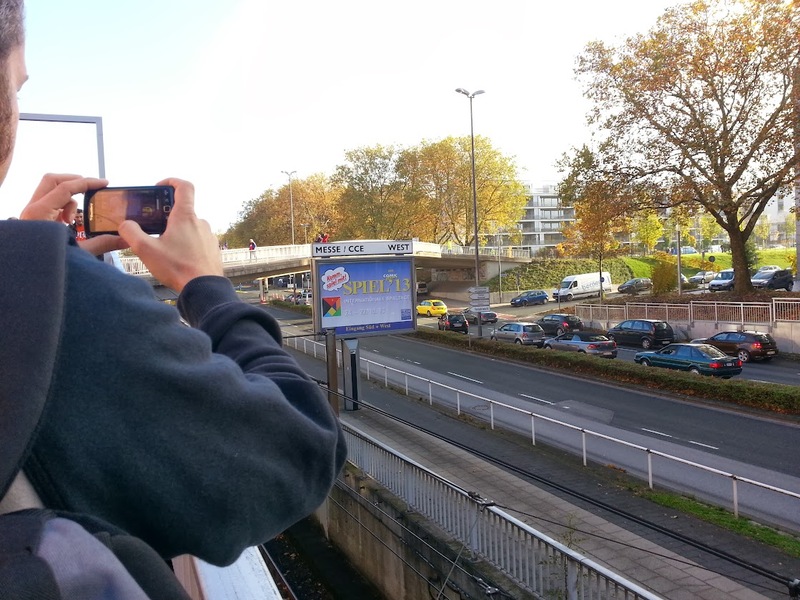 The good news though is that i will be returning from Essen. The Mecca of board games. The biggest board games exhibition in the world which is from 24 to 27 of October. I’m going with a friend and we are flying through Vienna and Dusseldorf and then finally to Essen by car or train. It’s the first time that i’m traveling somewhere and spending most (basically all) of my time at a single location. That basically sums it up. What i expect these days to be like. I’ve already made my list of board games to check out, downloaded quite a few rulebooks (64 actually) and also left as much space as possible in my bag (half empty). I’m not planning to buy games but i have to be realistic. I will buy a few. It’s inevitable. And that’s what’s making this trip so fantastic. A friend of mine went to Florida and to the Disney theme parks. This is something that i don’t find appealing at all. However, i do understand the feeling. It’s the feeling of being 10 years old again and i’m loving it! Every now and then a movie catches you by surprise. It’s difficult to pinpoint exactly in what Cyrus excels at but the overall impression it left me was just “wow”. Jonah Hill i like a lot and Marisa Tomei i’ve been in love with ever since My Cousin Vinny. John C. Reily though…. What can i say. I hated him as an actor and probably every single movie i watched in him. But in this one he is tremendous. Absolutely tremendous. I have a soft spot for coming of age movies. Maybe it’s because i’m still going through mine! The Way Way Back is such kind of movie and it’s a wonderful one as well.